Deaf Centre Manitoba Inc.: Winnipeg Public Library announce that March-April Guide to Program is now available!! 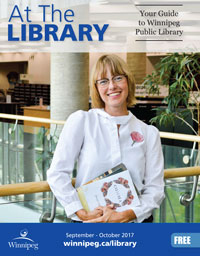 Winnipeg Public Library announce that March-April Guide to Program is now available!! Happy almost-spring! The March-April issue of At The Library is now available with hundreds of free programs. Some programs require registration. Spring pre-school program registration begins Friday, March 11 for Baby Rhyme Time, Time for Twos, and Pre-School Story time. The spring session runs the week of April 11 until May 30. Register in person or by phone. Note: Family Story Time is drop-in. No registration required! We are pleased to partner with the National Centre for Truth and Reconcilation on a 3-part lunch hour series. Learn the history of residential schools, their legacy, and the role of the NCTR in promoting reconciliation. Millennium Library: Tuesdays, March 22, 29 and April 5 from 12-1 pm. Spring Break programs for tweens, teens and children and families will ensure you’ll never hear the words “I’m bored”. Fiddling, puppet shows, Reading with Raptors, crafting and hands-on experiments are all on offer. Load up on movies, music, books, eMagazines and eBooks, too. West End Library will be open late on Saturday, March 12 from 5-9 pm with games, books and music to coincide with the Cindy Klassen Rec. Centre free family and teen swim night. Save the date for the Friends of Winnipeg Public Library's fundraiser Books & Brunch. This year's popular event features comedian Lara Rae and writer Catherine Hunter speaking on "Books I have Known and Loved" and is once again held at the Gates on Roblin. Ticket information is at friendswpl.ca.